After the medical breakthrough of finding a vaccine for Dengue virus, another mosquito-related virus threatened public health, particularly pregnant women and their unborn children. Centers for Disease Control and Prevention, a respectable organization where one new health threat can be identified per year on average, released a travel warning to the public to be cautious whenever travelling to affected areas namely the South and Central America, Samoa, Tonga and the Caribbean. Whilst Zika virus is not considered life threatening for non-pregnant population, the effect of this virus to pregnant women especially to the unborn fetuses they’re carrying is devastating. This virus has been linked to microcephaly, a condition where the infant was born with unusually small head and under-developed brain. Based on CDC report, around 4,000 cases of microcephaly have been reported in Brazil alone since October 2015. This cluster of cases is concluded to be because of the Zika epidemic. As of now, there are 28 more countries affected by Zika, excluding Brazil. World Health Organization (WHO) has identified Zika Virus as a global health threat already. So what are the actions taken by the Philippine Government to defend public against this new health threat? 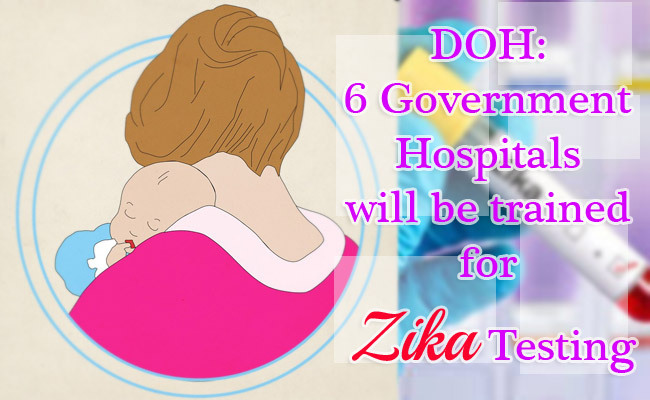 Department of Health (DOH) Secretary Janette Garin said that Research Institute for Tropical Medicine (RITM) will train 6 government hospitals for Zika Virus testing in the next few days including Baguio General Hospital, Vicente Sotto Hospital, Southern Philippines Medical Center, Lung Center of the Philippines, and San Lazaro Hospital. There are 1,000 testing kits available already and another thousand will be delivered in the next weeks. However, Garin made a clarification that not everyone who is showing symptoms will be tested to avoid panic and to maximize efforts and expenditures. According to Garin, the common symptoms of Zika are fever, rashes and conjunctivitis or redness of the eyes. Zika Virus is transmitted by daytime-active Aedes aegypti and arboreal mosquitoes like Aedes africanus, Aedes hensilli and more. It can also be transmitted through sexual contact, blood transfusion and can be passed on to unborn fetus. Aedes genus is also the carrier of Dengue virus. Garin advised the public to keep the surroundings clean and encouraged everyone to use mosquito repellants and to dispose containers that can be used as breeding nursery for mosquitoes.